Need a storage solution for your DVD's or books? 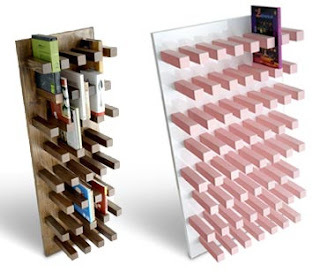 Look no further than Nobody & Co.'s (http://www.nobodyandco.it/) Piola bookcase. After spotting this awesome unit on the Apartment Therapy website back in June, I knew I just had to own one. Unfortunately, it's a bit expensive for my blood. You know you can't afford something when instead of a price they put, "Price Available Upon Request." So, instead of robbing a bank to afford the Piola, I waited and created my own. Since I already have book storage, I used wider and thinner "peg" pieces to turn my Piola knock-off into a DVD holder. Though I ran into many snags along the way, it was definitely worth the time. As far as supplies go, all you need is a circular saw, a power drill, anchors, wood screws, a level, and wood. I chose to use several pine 3" x 6' pieces cut down into 3" by 4" strips. For the backboard, I used a 2'x 4' composite. After making the proper measurements - measure once, cut twice - and cutting the pegs down to size, it was time to drill. I recommend having a buddy handy. It can be hard to drill the pegs in while holding the board and keeping things level, believe me! You may also want to check your rows periodically to make sure your books or DVD's will fit. Redoing work is NOT fun! Once the pegs are drilled in using the wood screws, it's time for a light sanding and a quick coat of paint. I wanted the grainy wood look so instead of using primer, I spray painted directly onto the wood surface. For a smoother finish, you'll want to smooth out all imperfections, do a coat of primer, and then add your paint color. Since my shelving unit is just for DVD's and is made of light-weight woods, I chose to anchor it directly to the wall using butterfly anchors. If you're storing books or using a thicker wood, you may want to use additional anchors - top, middle, and bottom - or you can try a cleat system. So far, so good. Though it took a lot of drilling and cutting and a lot of frustration, I'm happy with the final outcome. Perhaps my next project will be the Bibliochaise, another Nobody & Co. design. Talk about a reading chair! !